In the final few years of the twenty-first century, life in Paris is quiet for Ebriel Serique and her family. They live protected by the glass walls of their skyscraper apartment, safe from the poverty-stricken inhabitants in countries on the other side of the Line of Partition. Talented, comfortable, and content, Ebriel never questions her life. Until one day, her husband and daughter go sailing, and are murdered by terrorists who claim their yacht had crossed the Line.
. . . a literate, musically informed story of personal courage and fortitude in the face of evil that will appeal to all who root for the underdog. . . Marley's writing is lyrical and persuasive.
. . . Marley reinvents the World War II French resistance movement in a future world in which the Line of Partition separates the haves from the have-nots, a Line which totally blockades traffic, trade, and even medical aid. Have-not nations are supposedly rife with plague, fallout, and war after the economic crash when oil reserves ran out . . . Flutist Ebriel Serique lives with her husband and daughter in Paris and doesn't think too often about the other side of the Line. Then husband and daughter are murdered, supposedly because their yacht crossed the Line with medical supplies. InCo gives Ebriel no answers, and when she reveals her situation on an underground network, she is incarcerated and kept dosed with tranquilizers. But a secret resistance movement led by a badly crippled, charismatic scientist frees her, and through fierce action, Ebriel rediscovers the ability to care and love. Marley never lets polemic overwhelm plot in this passionate story.
. . . When Parisian flautist Ebriel Serique loses her husband and daughter in a terrorist attack, she seeks justice from InCo, the global agency that rules the civilized world, only to find her protest rewarded by imprisonment in a mental institution as part of a government cover-up. After a group of resistance fighters rescues Ebriel and introduces her to a movement known as the Chain, she discovers her true goal in life--the liberation of her world from a tyranny of politics and technology. The author of The Glass Harmonica weaves a complex tale of one woman's struggle against a corrupt regime. Set in the near future, this fast-paced, thought-provoking novel belongs in most libraries. The Maquisarde is, first and foremost, a novel about abandonment: powerful nations abandoning the weak, government leaders choosing not to help their citizens, even individual parents who desert their children. . . Marley has a way of infusing tragic characters with a sense of purpose and emergent hope, and her portrait of Ebriel is that of a woman in motion . . . The Maquisarde offers a palette of emotions and reactions, including unexpected moments of brightness and splashes of romantic sensibility.
. . . This is the story of a woman who undergoes a change from an elitist into a revolutionary, a person who comes to symbolize to the world that there is a change needed in the world order. 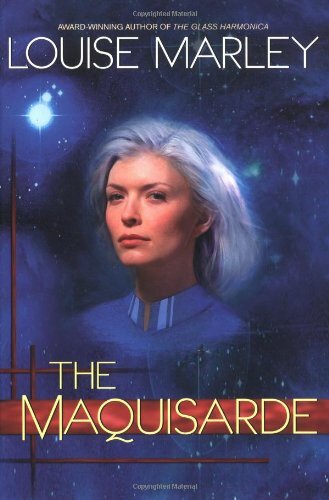 Louise Marley has an uncanny ability to make the reader feel that the events in The Maquisarde are really unfolding, sort of like turning the pages of the Neverending Story. The heroine makes mistakes, learns from them, and gets a second chance at happiness. Readers will admire her grit, determination, and courage, but mostly appreciate Ms. Marley's ability to paint a picture of a world turned much colder and nastier than Dickens' worst nightmare. Louise Marley's first hardcover release is a surprisingly moving novel about a young woman's desperate quest for justice. . . what begins as a high-energy story of international political intrigue and top secret military operations turns into a very touching tale about one woman's journey of healing and self-discovery. Marley succeeds in not only weaving a brilliantly complex tale with realistic, flawed characters, but also in touching the reader on an emotional level. Late in the 21st century, a flutist living with her family in Paris safely inside the 'Line of Partition' flees in grief after a tragedy and becomes a maquisarde, a member of the resistance who must face the truth about the forces that have brought evil to the world. Marley's strong women characters and compelling action will draw in even those who think they don't read this genre! You say you want a revolution? Musician Ebriel Serique certainly does, for the tranquil life she once knew has been turned upside down . . . Ebriel stumbles on her path, eventually into the hands of the revolutionary maquis, a group determined to shine the light of truth on the lying government. Amid the maquis, Ebriel finds a new home, and a new family led by a mysterious man they call Papa. Ebriel shuns the music she once so dearly loved, for there is nothing left but her need for revenge. The Maquisarde explores both sides of Ebriel's revenge . . . she is confronted with truths and questions she could not imagine along her journey. It is no light matter, for Ebriel or author Marley. Marley allows Ebriel to explore that journey's complete scope; there are losses, but there are gains; there is shadow, but there is light. I believe one of Marley's greatest strengths as a writer is that she allows her characters to grow. She allows them to fail and learn. None of her characters is a boulder that cannot be budged; everyone changes over the course of a Marley novel. What I like best about The Maquisarde is that is is a journey into and through grief. There is the promise of another side. What is there, we cannot always immediately say. It is enough for the side to exist. It is a joy to watch Ebriel Serique fight to get to that side. Marley ratchets this hair-raising plot to one with breathtaking levels of suspense. She is inventive, sensitive to nuances, and possibly prophetic in her view of mankind as desperate and even reckless in the pursuit of the old freedoms . . . If you are looking for a writer with a provocative view of the future, Marley delivers. Her stylish, measured prose and ability to create scenes with energy that crackles and fizzes is a treat.